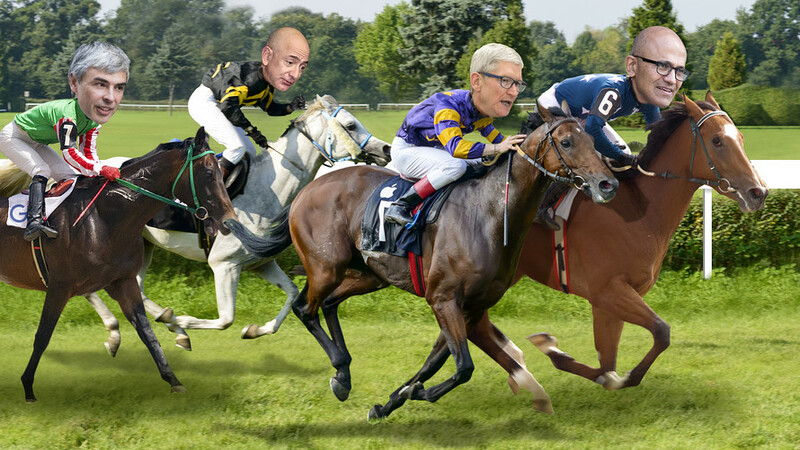 Apple cloud- After nearly a decade of Apple Inc. dominance, there is an evolving four-way race among the top tech giants that is pitting the cash cow against a trio of cloud-computing colossuses. On Friday, Microsoft Corp. MSFT, -4.00% MSFT, -4.00% MSFT, -4.00% ended the week as the most valuable company, surpassing Apple AAPL, -3.57% for a title the iPhone maker has held for most of the past seven years. On Monday, Amazon.com Inc. AMZN, -4.12% briefly became the most valuable U.S. public company, before falling back. After Tuesday trading, Apple was back on top, about $5 billion ahead of Microsoft and $23 billion ahead of Amazon. Behind those three, but not forgotten, is Google parent company Alphabet Inc. GOOG, -3.01%GOOGL, -2.92% which was the company pushing for Apple’s throne less than two years ago. Apple became the world’s most valuable company in 2011 by surpassing Exxon Mobil Corp. XOM, -0.96% , fueled by its hefty cash-generating business, high profit margins and strong iPhone sales growth. In August, Apple even became the first company with a $1 trillion market cap. But Apple lost that trillion-dollar valuation in a giant tech selloff that was partly of its own making, as investors worried about the slowing growth rate of the iPhone. That has allowed three tech companies with lesser financial results but potential monster cloud-computing businesses to creep up on Apple. Microsoft, Amazon and Google can’t hope to compete with Apple on profit. Apple reported a whopping $59.5 billion in net income for its most recent fiscal year, which was complete at the end of September. That total surpasses the combined profits of Amazon, Alphabet and Microsoft in their most recently completed fiscal years. Investors betting on Apple’s competitors for the top spot are not looking at results, however, as much as growth rates and tech trends. Namely, the growth of cloud computing, which is dominated by the other three companies at the top of the valuation list. The two companies closest to Apple’s spot are reporting huge growth in their cloud-computing businesses, where they offer cloud services for a huge range of customers, large and small. Staid old Microsoft, which has never been an official part of the much-vaunted FAANG grouping of tech stocks, surged into a zone of its own this year, propelled by hefty growth in the cloud. Amazon’s jump Monday came after the conclusion of its annual conference focusing on the Amazon Web Services cloud-computing business, AWS re:Invent, a five-day event that highlighted new products, including a big focus on machine learning and artificial intelligence in the data center. Amazon announced its own custom designed chip, rolled out a slew of products focused around AI and an Amazon hybrid-cloud service. “Amazon’s rapid pace of innovation is on full display at re:Invent,” Robert W. Baird analyst Colin Sebastian reported from the show. AWS played a major role in the development of what we think of today as corporate cloud computing, when it launched its utility-like service in 2006. At Microsoft, from the day in 2014 that Satya Nadella took over from Steve Ballmer as chief executive, the company has been completely focused on catching Amazon. The post It’s Apple vs. the cloud in race to be the world’s most valuable tech company appeared first on erpinnews.